New students form the UCCS letters as part of welcome week activities. COLORADO SPRINGS — More than 12,400 students enrolled at the University of Colorado Colorado Springs for the fall 2017 semester, a 3.6 percent or 427 student increase from last year’s record student enrollment. The university’s official census was Sept. 7. Figures were released Sept. 12. The CU Board of Regents received preliminary figures at its Sept. 7 meeting. Official figures show fall enrollment at 12,422 students, a 3.6 percent or 427-student increase from the 11,995 students who enrolled last fall. Of those students, there are 10,437 undergraduate students, a 250-student or 2.5 percent increase from the 10,187 students who enrolled last fall. There are 1,822 graduate students enrolled, a 156 student or 9.4 percent increase from last fall. Enrollment of new freshmen declined by 36 students or 1.75 percent from last year’s record class. There were 2,020 freshmen students who enrolled for fall 2017 compared to 2,056 in 2016. The 2016 freshmen enrollment represented a 418 student or 25 percent increase from the 1,638 freshmen who enrolled in 2015. UCCS students are from all 50 states and more than 2,000 are military affiliated. 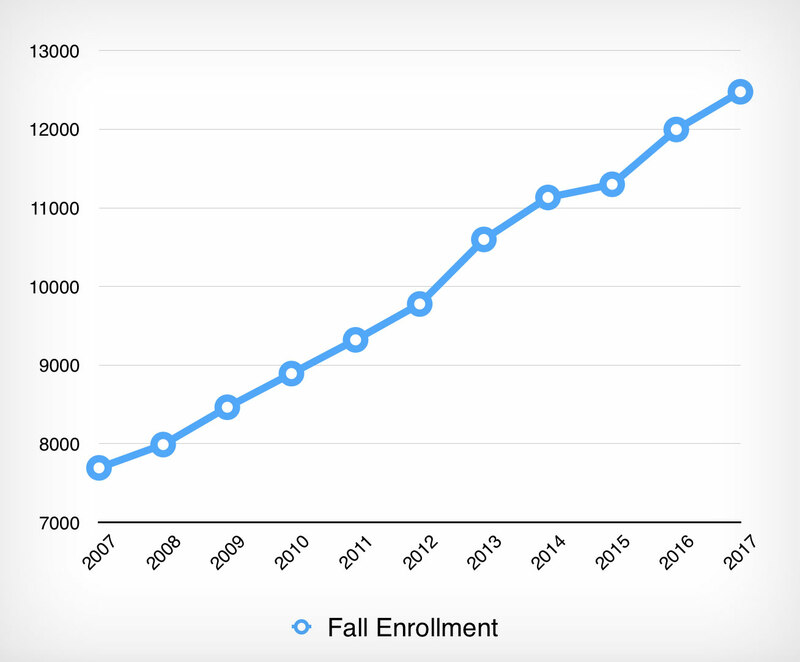 In the past decade, UCCS enrollment increased by more than 60 percent. There were 7,715 students enrolled for the fall 2007 semester. The University of Colorado Colorado Springs, located on Austin Bluffs Parkway in Colorado Springs, is one of the fastest growing universities in Colorado. The University offers 46 bachelor’s degrees, 22 master’s and five doctoral degrees. UCCS enrolls more than 12,400 students on campus annually including 3,300 in online programs. For more information, visit www.uccs.edu.